EDealer is proud to announce advanced listings with Kijiji PowerPlay Marketing. 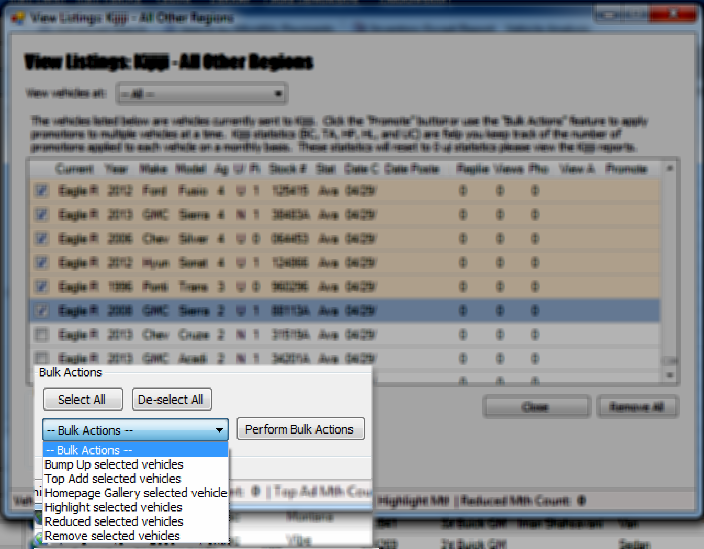 PowerPlay improves vehicle listing appearance and provides additional management features from PowerUp Dashboard. 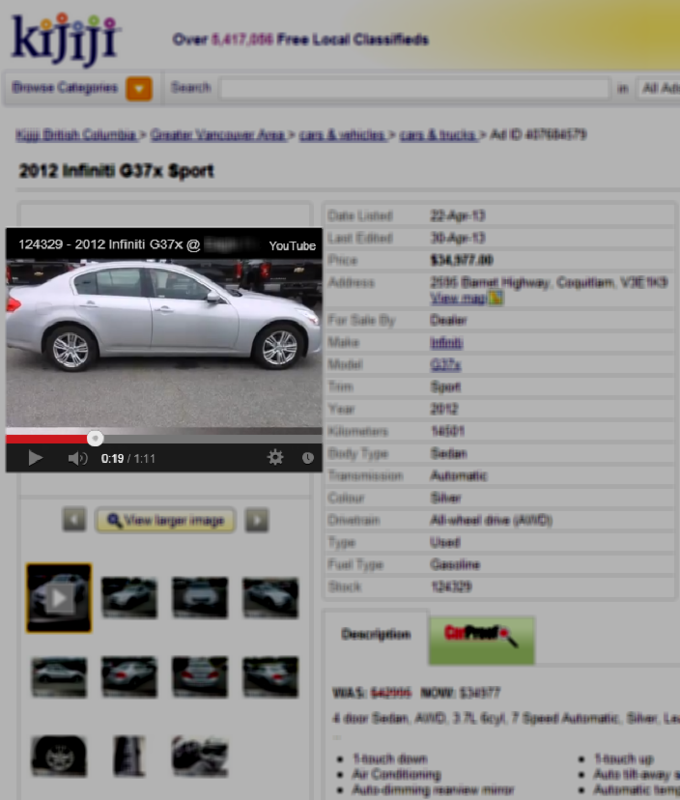 Kijiji PowerPlay Ads embed a Youtube video of your vehicle as the first picture in your listing. This means that users can just “click to play” the video without leaving your listing. Automatic Updates: These updates will be applied to every vehicle sent to Kijiji. Vehicle Options: Once entered into PowerUp, options will automatically be included in its listing on Kijiji. This eliminates the need to post the same information twice. Automatic Was/Now Pricing: In your Kijiji listing, the “Suggested” price for the vehicle in PowerUp will appear as the $Was price in the Kijiji listing, and the “Internet” price will appear as the $Now price. If your vehicle does not have an “Internet” price in PowerUp then there will be no Was/Now price text included in the Kijiji listing. User Defined Updates: These features only display information that you want. 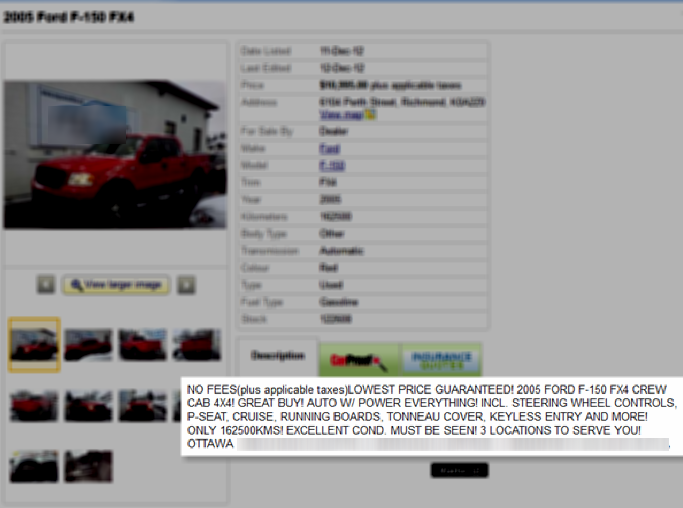 Dealer Name/Phone/Address/Website: Quickly and easily include this information in your Kijiji listings. In addition, submit links to New, Used, and Build and Price pages. These powerful back links will help increase organic website rank and click through from Kijiji listings. What’s the end goal of any advertising initiative? To generate sales. 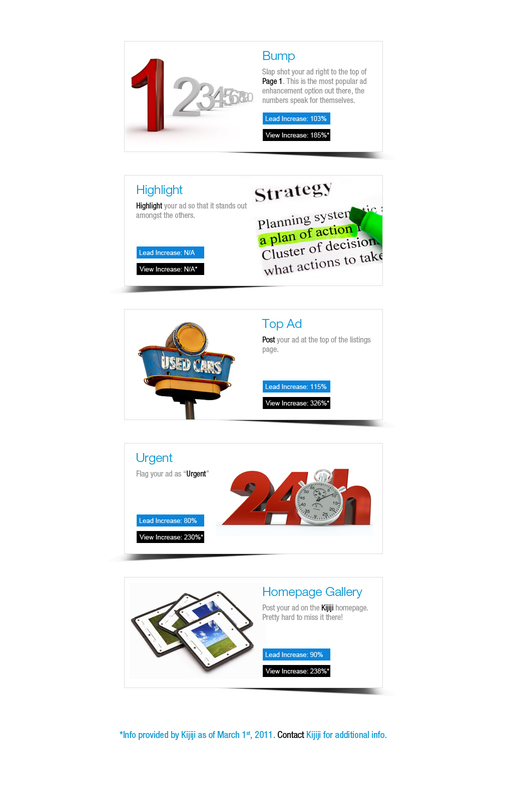 Drive in more quality leads from PowerPlay Kijiji listings painlessly with “Promote” and “Bump” features in PowerUp. Trouble finding your ad on Kijiji? 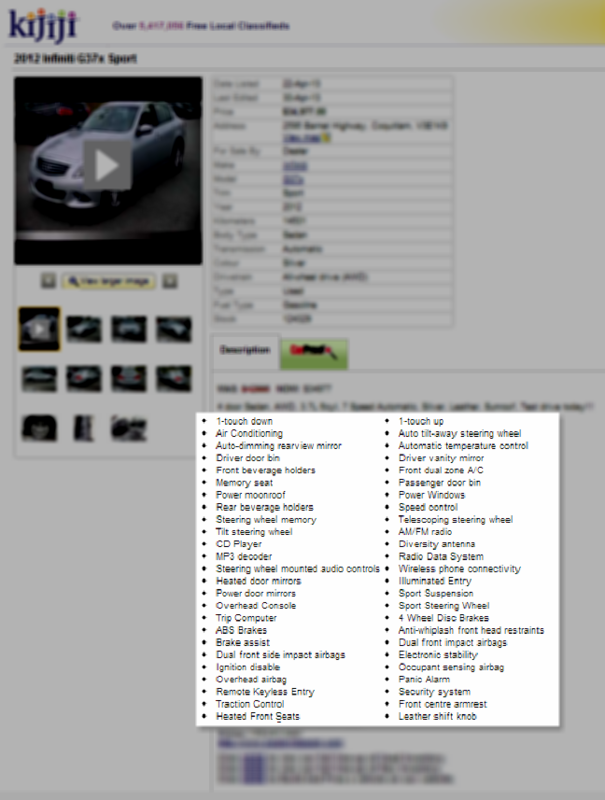 PowerPlay’s “View Listing” button makes seeing your listing for any vehicle just one-click away. 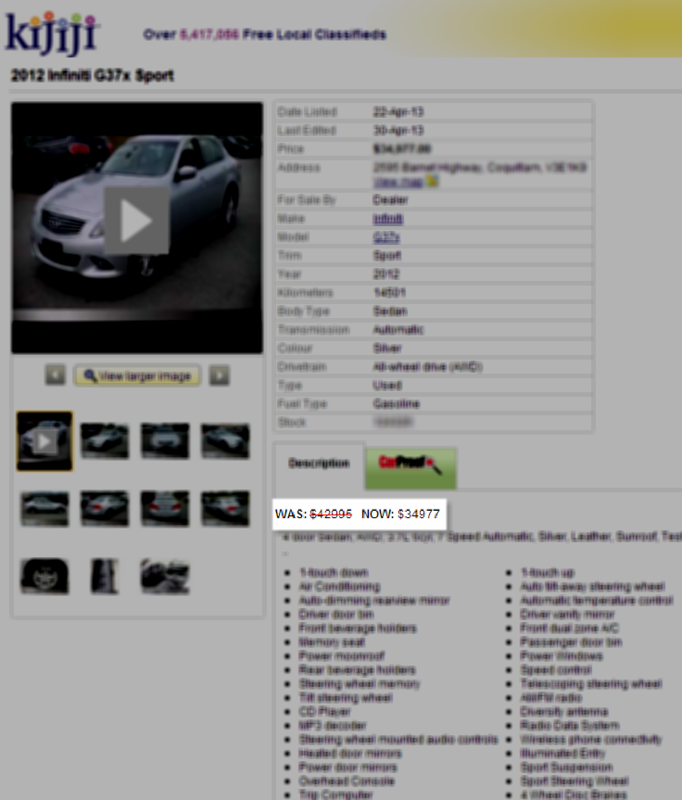 Enhancement Counter: Added to each vehicle to keep track how many times that listing is enhanced or promoted in Kijiji. Statistics Counter: This shows you how many times a vehicle listing was viewed, how many times it was replied to, and how many phone clicks the listing received. 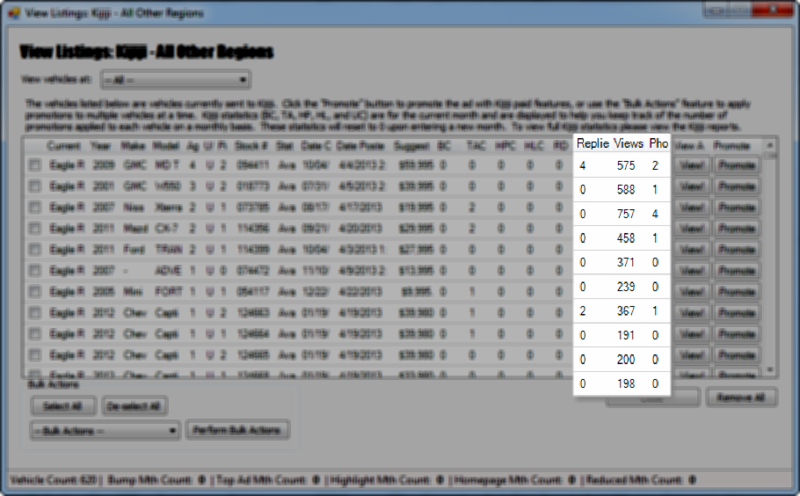 Aggregated Enhancement Counter: Displays all of the enhancements for all listings over the last month. PowerPlay converts Kijiji lead notifications to ADF/XML format for easy integration with 3rd party CRM systems. 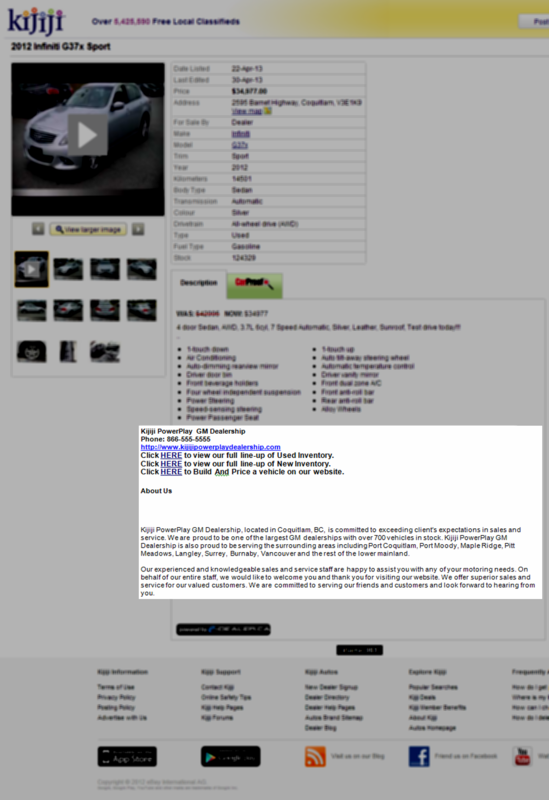 The custom HTML or Plain text descriptions in PowerUp automatically enhance your vehicle listings on Kijiji. The CarProof Report tab provides users with a description of Carproof benefits, in addition to the full report (where applicable). If the report is unavailable, the user can request one via “Ask for it” call to action. Contact EDealer to learn more about what Kijiji PowerPlay Marketing can do for you!